Antarctica is stunning, to say the least. Though the aesthetics and importance of the Earth’s southern-most continent are easily and often overlooked. I think this is unfair. It’s certainly biased against Antarcticans. But this oversight isn’t necessarily because people think the glaciers, mountains, Archipelagos, lakes, snowy deserts, penguins, whales, and seals aren’t especially beautiful or important. Presumably people think, or at least would think, quite the opposite—charismatic mega-fauna, icy caverns and all. However, my concern here is more spatial and cartographical. Or, rather, it stems from lingering frustrations related to the assumptions that underlie our spatial and cartographical representations of the Antarctic, and how those assumptions affect our understandings of what Antarctica is and its importance relative to the rest of the world. Indeed, the typical distorted, flattened, elongated pictures of Antarctica we get from North-Atlantic-centric maps—Robinson and Mercator projections alike—are, at best, disappointing and preclude thorough appreciation for the size, shape, place, value, importance, and beauty of the Antarctic continent. I mean—really—who are we kidding? Antarctica does not look like that. Obviously, some degree of distortion is inevitable when portraying spherical shapes on a flat surface—but this is exactly my point. Antarctica is rarely seen for what it “actually” looks like, nor in continuity, because of our typical Euro-centric-map-influenced perception of the world. Granted, world maps look like world maps, not like the world. 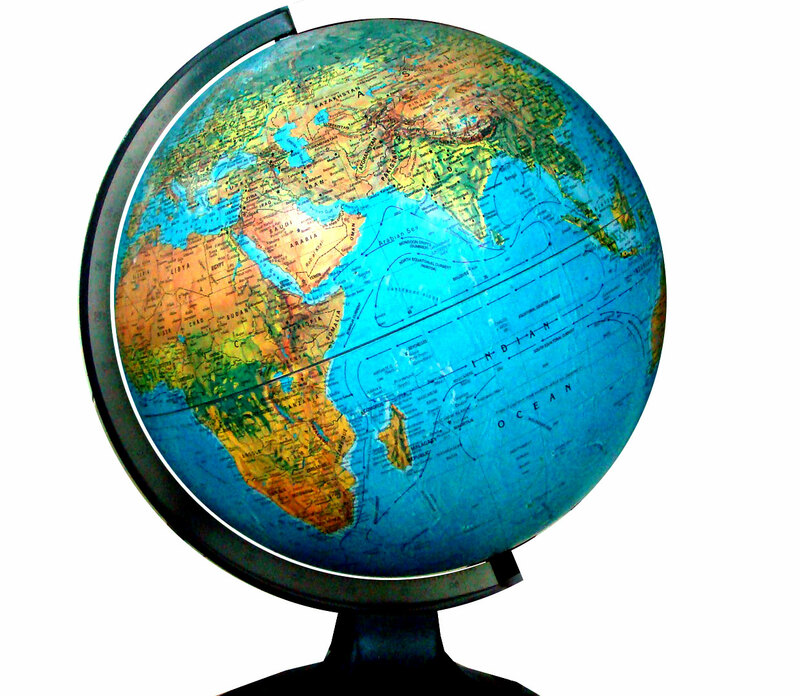 To that effect, globes are more accurate representations of the planet. But even then, Antarctica is usually at the bottom, mercilessly impaled and obscured by the trinket’s axis of rotation. Among the last of the pristine, unindustrialized, non-instrumentalized regions of the planet, the vast, isolated, solitary nature of the Antarctic wilderness is an awe-inspiring holdout of human non-interference, distinctly absent of permanent human habitation, perched unsuspectingly on top of the world. Wait. On top? Indeed. The idea that north is “up” goes largely unquestioned because our spatial orientation and perspective of planetary positionality has been dictated and subsequently assumed by northern-centric portrayals of the Earth created by sea-faring European explorers, navigators, and cartographers that saw Europe as both on top of and at the center of the world. The result is a historical legacy of Euro-Atlantic-centric maps perpetuated still today. But this presumed directionality and centricism is ultimately fiction. It would be just as correct to portray the South Pole as upward facing. For that matter, the same holds true of the East, West, and everything in between. After all, the Earth is just a sphere(-ish) object floating in space. There is no up or down in the void. For better or for worse, we tend to associate size and relative spatial position—i.e. above and below—with importance. Now, relative spatial orientation—that is, where X is located in comparison to Y—is certainly relevant, especially with regard to the Antarctic, to establishing our perceptions of importance. Often we assume that being “above” equates to being “better” and that being “below” equates to being “worse.” Poppycock. While socially prevalent, these associations are fallacious; they are more a pernicious matter of habit than of justified belief. Writing from Brisbane, Australia at the moment, the idea of being “down under” seems particularly salient, but in no way should being down under be presumed as or used as a pejorative term. Most would probably contend that Antarctica is “below” North America, and that it’s at the “bottom” of the Earth. But Antarctica is neither above nor below any other continent, Australia and North America alike. We just happen, by instrumental and anthropocentric convention, to portray it that way. In turn, we do Antarctica itself and its inhabitants a serious disservice and minimize the perceived importance of the southern-most continent. With regard to size and perceptions of importance, we also tend to think that “bigger is better” and that we ought to prefer the large. Growing up in Texas, these were simply tenants of the Good Life. But, again, these are specious premises at best. Gargantuan, obnoxious, unwieldy automobiles in a congested urban landscapes, for example, are far from preferable. Imagine trying to park an H2 in Manhattan. To the same point, if the Sun were any larger than it is, life on Earth probably wouldn’t have developed as it has and all of our human shenanigans would have been physiochemically and energetically precluded. Bigger is not necessarily better. Indeed, Schmacher’s “Small is Beautiful” profundity has been hailed as revolutionary by localists, anarchists, environmentalists, and environmental economists since being published in the 70s. But sadly, others have noted, the idea is slowly being forgotten in context of global industrialization and an ever-growing human population. It also seems important to point out that while the United States measures in at 3.794 million square miles and Europe at 3.931 million square miles, the Antarctic continent spans a whopping 5.405 million square miles—a difference in size we probably wouldn’t expect given the misleading flat and stretched portrayal of Antarctica we’re used to. Perhaps Europeans are less guilty of associating size with importance, but Americans tend to especially value the big over the small—so maybe noting Antarctica’s comparative largeness could help motivate a shift in the equivocation of size, value, and importance. If size matters, Antarctica matters more than the US and Europe. The Peter’s Map—an area-accurate projection—speaks to this point. Typical Euro-Atlantic-centric projections disproportionately represent the size of the northern hemisphere and portray the continents of the southern hemisphere as much smaller than the comparative reality. The Greenland Problem is a good poster-child for this disproportionality. In Mercator projections, Greenland looks to be of similar size to Africa. But in reality, Africa is 11.67 million square miles whereas Greenland is only .8363 million square miles; the former is almost 14-times larger than the latter. 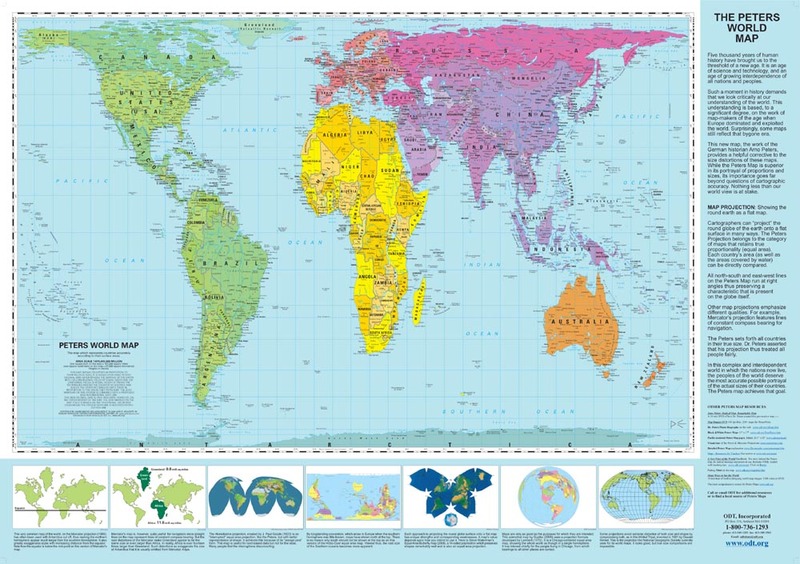 Granted, the Mercator projection was created for navigation, not necessarily for proportional accuracy, but if maps are supposed to depict reality in shaping our worldviews, then we’ve been living in a Mercator fantasy. Regarding the Greenland Problem, the Peter’s Map is certainly an improvement. But it comes with shape distortions of its own, so it’s far from ideal. 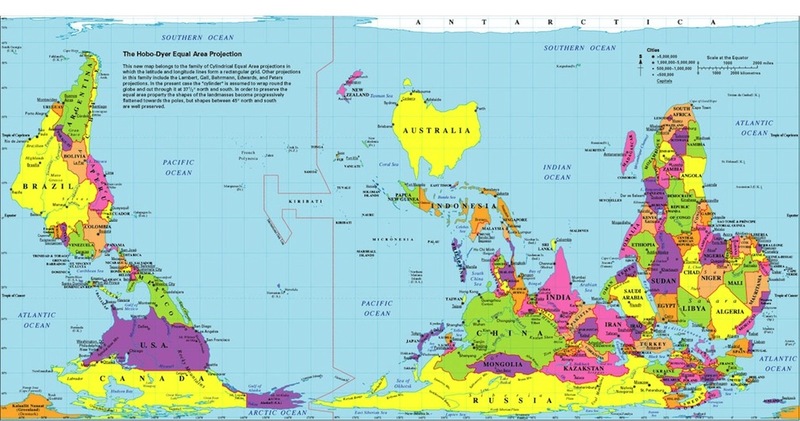 Moreover, while the Peter’s Map is a more accurate proportional representation of size than the Mercator projection, it still does nothing with regard to the fair treatment of Antarctica. Peter’s Antarctica is still relegated to the bottom of the map, split along its radius, and flattened out. Ultimately, no map will ever be perfect, nor will every map serve every purpose. Rather than trying to find “the best” map, we might prefer to be cartographic pluralistic relativists and insist that various projections be displayed together, side by side, in every case so that no single worldview is ostensibly portrayed as “better” than any other, and in turn, prevent the disproportionate assignment of value and importance that accompanies visual representation and evaluation of the Earth. Alongside the Mercator, Peter’s, Hobo-Dyer, “south-as-up,” and Robinson projections, so too belongs an Antarctic-centric perspective. 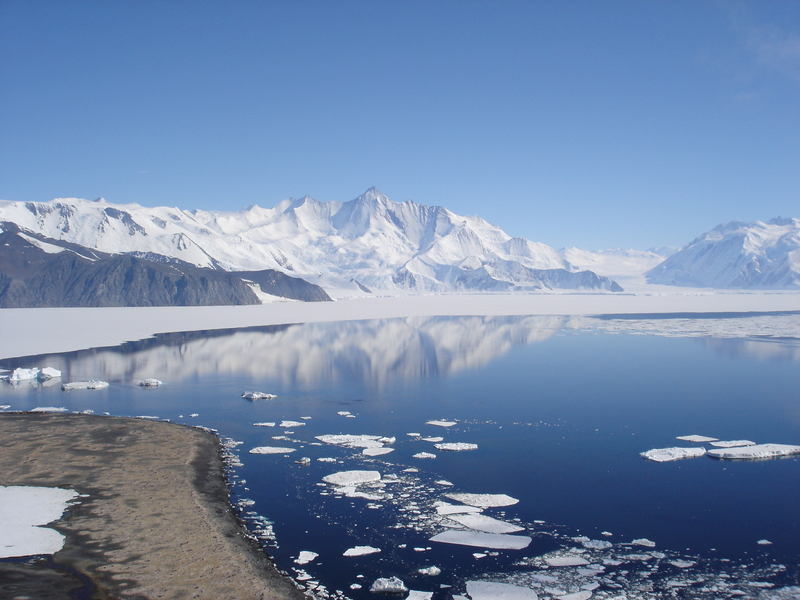 If Antarctica is going to get a fair shake in politics, ethics, and the allocation of resources, then we ought also consider and incorporate a worldview where Antarctica is the center of attention. 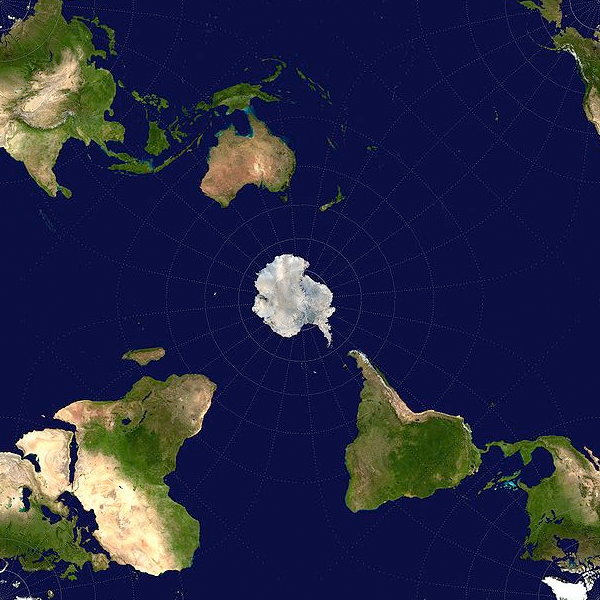 Besides, Antarctic-centricism makes for a beautiful map. And we all know what they say about a picture’s worth in words. This entry was posted in Axiology, Environmental ethics, Environmental philosophy, Environmental policy and tagged Africa, Antarctica, Antarctica-centric, atlantic-centric, Australia, bigger is better, down, earth, euro-centric, Europe, Greenland, Hobo-Dyer, importance, maps, Mercator, north, North America, Peter's map, Robinson, Schumacher, size, small is beautiful, south, the Good Life, the Greenland Problem, United States, up, value. Bookmark the permalink. An interesting insight. If we saw it more often, it might be on our minds more and probably give us a deeper connection to the Poles. I have always agreed there’s a need for a more proportional representation of the poles and a way to at least not cut them in half on every map. The Greenland problem is funny to me, because as a child, I really thought it was a huge, green place with very few people (and it’s not even green!). My research has very often focused on the poles, so I have never been able to use the typical map representation and always ended up using polar-centric maps for my data. I do have the sense that the poles will be much more important to map-making as climate change melts ice and resources become more accessible. The Russians have already drilled to subglacial lakes in Antarctica, making me wonder if soon people won’t be able to tap other below-surface resources for other-than-scientific reasons. I imagine economic interests (like the increased efficiency of passage across the Arctic Circle by ship) and exploration of the polar regions for natural resources will make polar-centered maps a much commonplace.